RM Auctions, in association with Sotheby’s, offered the Milhous Collection during a multi-day sale, February 24-25, 2012 in Boca Raton, Florida, resulting in over $38.3 million in sales and 100% of all lots sold. The result of over 50 years of dedicated collecting by brothers Bob and Paul Milhous, the Milhous Collection auction presented a range of rare mechanical musical instruments, automobiles and collectibles before a packed house. Bidders represented 18 countries from around the world, including as far away as China, Russia and the United Arab Emirates. Strong prices were recorded across all categories in the RM Auctions Milhous Collection sale with contests between multiple bidders and prices frequently exceeding their estimates. The highest price of the multi-day auction went to a Pebble Beach class-winning 1912 Oldsmobile Limited Five-Passenger Touring, chassis number 64626. The only known surviving example from that year and featuring one-off coachwork, the Oldsmobile attracted strong bidding, realizing a final sales price of $3,300,000 to set a new world record for an Oldsmobile sold at auction. Headlining the RM Auctions Milhous Collection auction was a series of automobiles, spanning the spectrum of the collector car market from high-horsepower Brass era cars to a roster of coachbuilt classics and Indianapolis racing cars. In addition to the sale-topping Oldsmobile, a 1939 Lagonda V-12 Rapide Sports Roadster, delivered new to actor Robert Montgomery, more than doubled its pre-sale estimate selling for $990,000 to set a world record for a road-going Lagonda. The Pebble Beach “Best of Show” winning 1934 Packard Super Eight Convertible Victoria by Dietrich, the first car acquired by the Milhous brothers, garnered $308,000. In addition to the motor cars, the sale was highlighted by an offering of mechanical musical instruments, considered among the rarest, largest and most mechanically complex and decoratively elaborate examples in existence. The sale was a benchmark for these types of pieces, the range of which had never previously been seen at auction. Leading this part of the sale was the 1903 Ruth Style 38-B Fair Organ. One of only two examples known to exist, it generated a lively bidding contest before selling for $1,265,000. Another one of the highlights of the Milhous Collection and the sale was the ornate Gaudin 125-Key Dance Organ which sold for $1,150,000. The centerpiece of the collection, the 46-foot custom built carousel also drew strong interest from collectors. A one-of-a-kind, fully-functioning work of art, it spurred a lively bidding war in the room and on the phones, realizing a final sales price of $1,207,500 to applause from the crowd. The catalogue of 509 lots was rounded out by an assortment of other collectibles, ranging from ornate hall and tower clocks to such decorative art pieces as Tiffany lamps and various artworks, as well as a series of petroliana, neon and porcelain signs, unique gasoline-powered tether cars and models and a large range of firearms from the late 19th century. The clocks in sale were led by the E. Howard Four-Dial Painted Cast Iron Eight-Day Post Clock which soared over the high estimate to sell for $106,375. A further highlight of the clocks in the sale was a Black, Starr & Frost Hall Clock which fetched $103,500 against a pre-sale estimate of $50,000 – $60,000. 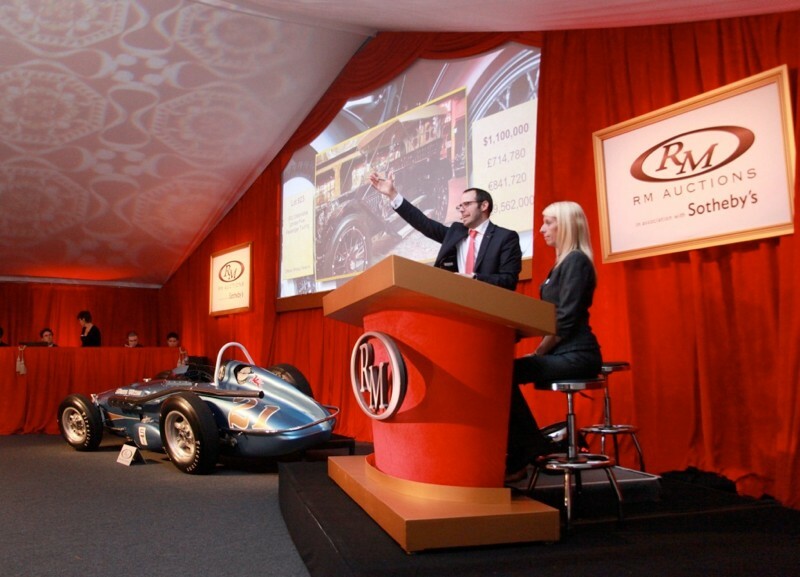 RM Auctions will wrap up in Florida, March 10, 2012 with the presentation of its 14th annual Amelia Island sale held in conjunction with the Amelia Island Concours d’Elegance. For more information, visit www.rmauctions.com/amelia.